So was Jesus just being complementary to Peter, trying to build up his ego? Was He just thanking Peter for acknowledging who He really is? Or was Jesus doing something more? Was He making Peter a promise that would one day come to fulfillment? Certainly it was the latter of these. Jesus was telling Peter that he would become the rock foundation of the Church and that Peter would enjoy a unique spiritual power of the Keys of Heaven. Whoa! What an incredible gift that was! Jesus says, “Whatever you bind on earth will be bound in Heaven…” This is no small gift to have. We should take this as a literal commitment from Jesus to Peter. 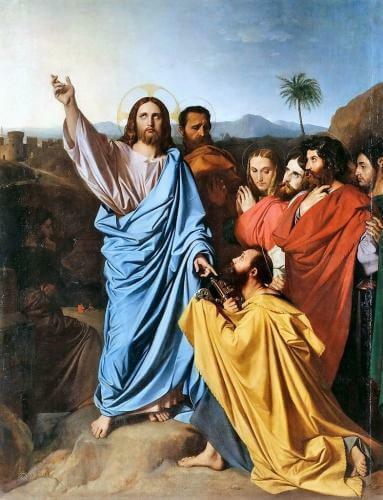 So, when Jesus did found His Church, when He did “breathe” on the Apostles after His Resurrection, He also bestowed this promised gift of supreme authority within His Church to Peter – the power to bind and loose. I’m sure that at first Peter did not fully understand this unique gift. Perhaps as the Church began, within the first few years, the other Apostles would have been reminded by the Holy Spirit that Jesus said this. Perhaps Peter in his humility would have been reminded by the Holy Spirit that Jesus said this. And as time went on there should be no doubt that Peter began to embrace and own this unique gift of supreme authority. We see the first clear exercise of this authority in Acts 15, at the Council of Jerusalem, when there was a disagreement about circumcision. After much debate, Peter stood up and spoke with authority. From there, others followed and we see that the question they were debating was clarified and settled. From that time on, the Apostles continued their work of teaching, shepherding and sanctifying. Peter eventually went to Rome to preach and to become the first bishop there. It is in Rome that he died and it was every successor of the Apostle Peter, in Rome, who took on this unique gift of the supreme authority within the Church. Certainly Jesus did not intend this gift of supreme authority to last only as long as Peter lived. That’s why we see this authority passed on to all his successors who are the bishops of Rome. And that’s why we call our Church the Roman Catholic Church. Interestingly, if Peter would have gone to Malta, or Jerusalem, or Asia we would today most likely have the Malta, or Jerusalem, or Asian Catholic Church instead. So the Church is Roman primarily because that’s where Peter went and, therefore, that’s where the supreme authority lies. Over the centuries we have come to understand this unique gift of supreme authority and have defined it more clearly. It means that St. Peter, and all his successors, enjoy full and immediate authority to teach definitively on faith and morals and to govern, or shepherd, according to the mind and will of Christ. So if the pope says something is true regarding faith or morals then, quite frankly, it is true. And if he makes a decision on the governance of the Church then, quite simply, that’s what God wants done. It’s as simple as that. This gift of supreme authority, in regard to teaching on faith and morals, is called “infallibility.” It’s used in various ways. The most powerful way it’s used is when the pope speaks “ex cathedra” or, “from the chair.” This means symbolically from the chair of Peter. In this case he teaches what’s called a “dogma” of the faith. Every dogma is true and certain and we are bound in faith to believe. For example, in 1950 the pope spoke “ex cathedra” about the Assumption of Mary into Heaven. With that declaration we are bound in conscience to believe. Mary truly was taken body and soul into Heaven upon the completion of her earthly life. Period! Of course this power does not apply to those things that have nothing to do with faith and morals. So if the pope says he believes that Argentina will win the next World Cup, then he is only hoping, and I wouldn’t go bet all your money on them. He has no special grace to teach things of that nature. But wouldn’t it be fun if he did! Lord, I thank You for the gift of Your glorious Catholic Church! I pray that I may always be faithful to all that You reveal through Your Church and I pray that the leaders of Your Church, especially the pope, will always seek to grow daily in holiness of life. Jesus, I trust in You.